If you have ever wrapped your textbooks in contact paper, or attempted to place a screen cover on your smartphone, you’re probably painfully familiar with the frustrating bubbles that are created when air becomes trapped under the plastic. Sometimes it would seem nearly impossible to apply those clear sheets correctly and end up with an evenly finished surface. In the world of 3D printing, more specifically the FDM (Fused Deposition Modeling) process, a common analog could be the imperfections that occur from the layering of the filament during the printing process. Known as “steps” or “stair-stepping,” these artifacts occur when the printer completes one layer and moves up on the Z axis to start the next one, creating visible lines on the surface of the object. Owners of FDM printers, such as from MakerBot or Solidoodle, are probably all-too-familiar with this issue. 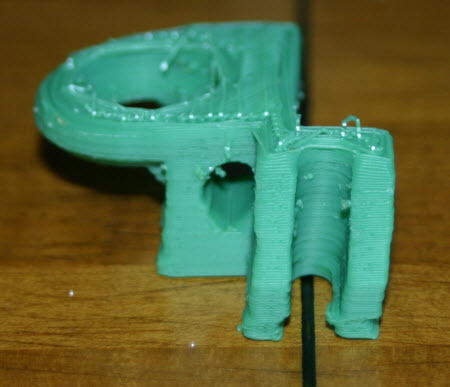 The “stepping” problem is clearly an area where FDM printers could be improved. Companies like 5AxisWorks are trying to solve the issue through hardware like their 5-axis printer, and Topolabs is developing software that tries to tackle the issue as well. A method determining that a portion of the surface of a 3D printed object will have a stair-stepping imperfection, then layering a “smoothing surface” over the layers of that over the stages of the step imperfection. The ability to adjust the angle of application when applying the “smoothing surface” or changing the viscosity of the filament DURING the 3D printing process by altering the temperature of the filament mid-print. This is based on the “support-to-support” distance; in other words, the distance between one edge of the stair-step or level, to the contact point on the next higher step, and whether or not this is farther than the “droop distance” of the filament, or the maximum distance where the filament can still maintain the shape. Computer-readable media having stored instructions that are able to determine, based on the desired 3D printed object, if and when there will be an artifact, and be able to project another stage of production that will ease the creation of the “smoothing layer.” It could also could create intra-contour support for the “smoothing layer,” as well as build smoother non-planar surfaces, while maintaining the intended dimensions of the 3D printed object. A controller on a filament-providing element of the printing device that would determine, using sensor data, that a printed object has an undesired surface flaw, and would then provide a “smoothing surface” over that flaw. This is not Adobe’s only foray into the field of 3D printing. In October, they announced 3D printing features for their extremely popular Photoshop software, which could integrate well with the claims described in this patent. They have also had several 3D printing-related partnerships, such as the one last year with Sculpteo, and have also partnered with artists like Bitoni for purely creative pursuits. It will be interesting to see how Adobe integrates the ideas from this patent into their wide range of products and processes. By successfully implementing these techniques, Adobe could push the boundaries of FDM printing and greatly improve the quality of the printed objects. Let us know what you think about this latest in 3D printing patent filings in the Adobe Smooth 3D Printing Patent forum thread over at 3DPB.com.